In case you didn't see, since the team acquired Brandon Drury I've been pushing for the Yankees to start Drury at second base while rookie Miguel Andujar plays third. From everything I've read on Andujar it's clear to me that he should be in the Majors to start this season. In 2017 Miguel destroyed opposing pitching at every level. He started the year in AA and hit .312/.342/.494 in 67 games, then he was promoted to AAA and hit .317/.364/.502 in 58 games, and even got four hits (two doubles) in seven at bats for the Yankees at the end of the regular season. While there's no doubt that his bat is ready for the Majors, many have pointed out that his glove could use a little more work. Which makes many others say Miguel should go to AAA to work on that defense before coming to MLB. So if Drury were to start at third base on Opening Day, what options are there for second base? And are those options better than allowing Andujar to work on his defense in the show? Tyler Wade's debut in the Majors last season did not go very well. He hit .155/.222/.224 in 58 at bats. That's not a huge sample size by any means, so that batting line does not tell the story. Tyler actually killed it in AAA last season batting .310/.382/.460. Mind you, that was a bit of an outlier to the rest of his minor league career (he hit .249/.331/.333 in 618 at bats in AA). Ronald Torreyes made a lot of fans in 2017 after hitting .292/.314/.375 in 314 at bats, not to mention his interviews after teammates would hit home runs. And let's not forget that Ronald is only 25, so he has yet to settle in, meaning 2017 may have been a peak at what he could offer the team in 2018 and beyond. While he is the least likely to start at second base, or anywhere else, on Opening Day for the Yankees, Jace Peterson is an option. He's actually appeared in six of the teams seven Spring Training games, which tells me the Yankees are giving him a serious shot at making the team. However the 28 year-old is coming off the worst MLB season of his career (69 OPS+), and was a little below average in his previous two seasons in the Majors. In my opinion, Jace would only be the Opening Day starter if the team really didn't want Andujar to start the year in MLB, and both Wade and Torreyes were hurt. So Miguel Andujar has a serious shot at making the Yankees out of Spring Training. However, I wanted to point out that the hype surrounding the guy right now is getting a bit out of hand. On the surface, having four home runs already in Spring Training is pretty awesome. But that's just it.. that's the surface. If you look a little deeper you might temper those expectations a bit. -Until this season Suarez has never thrown a pitch above A ball. He's also never appeared on the Phillies organizational top 30 prospect list according to Baseball America. -Until last season Shafer had not thrown a single pitch above A ball. While he hasn't been "bad" in the minors, his overall ERA of 4.84 is not worth getting too excited about. Oh, and like Suarez, he's never appeared in the Blue Jays' Top 30 prospects. -Nick made his MLB debut last season, and tossed 133 innings. Unfortunately they weren't good ones, as his ERA of 6.02 shows. To be fair he was pretty darn good in five starts in AAA before being promoted to the big leagues last season (1.41 ERA), and had an overall minor league ERA of 3.57. And while he did crack the organizational prospect top 10 list for the Braves, that was back in 2014. -After debuting in MLB in 2011, Pedro has only thrown 27 innings with the Mets, Red Sox, Braves, and just .2 innings last season for the Phillies. He actually didn't throw a single pitch in MLB in 2015 and 2016, as he was in the minors for the Orioles. His career ERA in MLB is 4.31, and at age 31 I don't think he's a good candidate to get better. 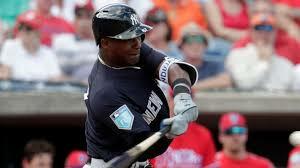 So let's just dial down the hype surrounding Miguel Andujar a little bit. Like I said... I still believe he should start at third base on Opening Day, while Brandon Drury starts at second, but I don't think it would be the worst thing in the World if he began the season in Scranton. no arguments here from me, as greg bird went ham last spring too, but he is hitting the tar out of the ball. lets hope he does and wins the job. be a nice little hidden gem.